Sharpen your skills with our Full Swing Golf Simulator. Shop online for gift cards, passes, and more. NOW OPEN FOR 2019 SEASON!! 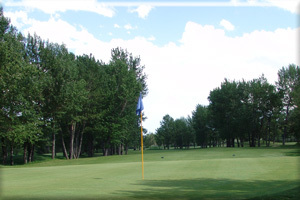 Nestled alongside the Sheep River, 3 km east of Okotoks, River's Edge Golf Club offers a fun and unique 18 hole golf experience. With captivating views of the Rocky Mountains and cascading sandy cliffs filtering into the river below, it is pleasurable not only to play, but to view as well. We are located only 12 minutes south of Calgary city limits off highway 2. Come on out and see for yourself why many people consider "The Edge" to be Calgary and areas best golf value. Winners in both the Morning/Afternoon League and Evening League receive FREE UNRESTRICTED GOLF MEMBERSHIPS at River's Edge for the 2019 Golf Season! 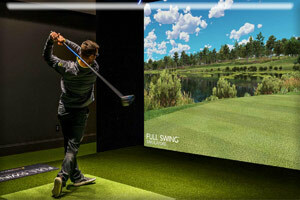 Click HERE for more information on our indoor golf leagues using the Full Swing Golf Simulator!! Space is limited and is first come, first served.